This is a kindergarten math quiz on addition of numbers within 1 to 10. 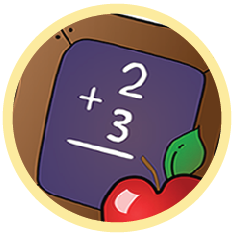 Learn with fun online and track your score as you progress. This quiz is interactive and self-paced hence children can learn on their own. In this quiz small numbers will be added for kids to choose the correct answer. This is an MCQ with different choices for kids to select from. Simply click on the activity, take the test and view you score. This will be very useful for parents and teachers at home and in the classroom.